Johann Bernhard Bach (1676 - 1749) Partita über "Du Friedefürst, Herr Jesu Christ"
The idea came into being during the planning of the festivities following the inauguration of the restored Schnitger organ in St. Mauritius, Hollern. 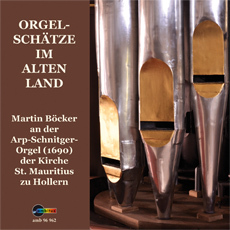 Within the framework of a concert, the idea was to let the music from those areas of Europe be heard to where Arp Schnitger delivered his organs, music by the organ builder's contemporaries. The decision to make the first CD-recording after the restoration along the lines of the programme of the festive concert was thus close at hand.